Welcome to the official headquarters of the MithraPride linkshell. The main function of the site is essentially a place for players to get together and ask questions and exchange information about the game, though the diversity of the group provides for some very off-topic conversation. 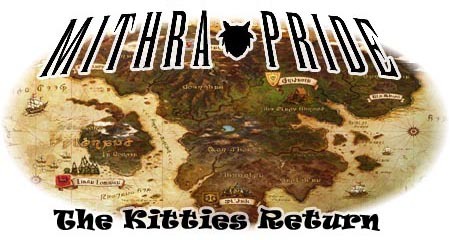 MithraPride was founded by Tigara during the beta test phase of Final Fantasy XI (FFXI). Now, MithraPride is starting to play Final Fantasy XIV composed entirely of Miqo'te, the cat-girl race of FFXIV, and their non-kitty friends. We currently only reside on Sargatanas. If you would like to join us, be sure to let us know in the forums. I know some of you kitties have already started working towards your end game gear. Though, we'll be doing our own set of organized runs come Saturday, October 5th at 9:00 P.M. Ifrit HM will be our target. Finish up your Lv. 50 jobs, get that AF armor equipped, and read up a bit. More details to come soon! After some thinking, I've decided that the boards need some organization, something that hasn't happened since FFXIV tried to launch the first time. Some ideas are to move the linkshell chat upward. Also to clear out the meet and greet and start some sort of profile page. We used to have a member system for XI, but that didn't really take off like I hoped. I've seen boards with people having their own thread work on other boards and think it'll be fun here. You can use that to post accomplishments, keep up your player profile, or just talk about whatever you saw in the game that you liked, or didn't. Will be moving dead boards to their own grouping, to see if anyone cares about them. I plan to do this after this weekend, unless I get a chance to do it tonight. I wouldn't want to make major changes while we're all playing this weekend. We are looking for those interesting in choosing a server for the merger to found MithraPride on again. The goal is to get enough mithras by the 19th for server applications. If you're interested, please stop by and say hi. We realize that a lot of you are frustrated with the game, and some have even stopped playing. If you do plan to come back, the Pride will be here. We are still dedicated to the game and will be trying to expand to keep the Pride moving forward. Square Enix plans to make a lot of changes in the coming months. I personally hope that you all give the game another chance once things settle down. FFXI wasn't the best game when it first came out... but the Pride made it better for everyone in the linkshell. I have that same feeling with FFXIV. Kitties have been working hard on the site. Golddess has implemented a new Gallery for us, so let's start filling it with pictures from Eorzea. Mystiana has completed a working version of the Member List, so now we know how everyone is fairing in the new land. Keep looking for more changes, and hopefully a Miqo'te themed signature system soon!